Marchese (Marquis) Mario Incisa della Rocchetta, father of Niccolo the present owner of the San Guido estate, was the pioneer who introduced non-native vines into the Italian wine scene. For more than twenty years following WW2 he experimented in creating Sassicaia, a unique Cabernet Sauvignon based Bordeaux-style wine. A fine autumn morning saw us at Tenuta San Guido, the winery where the famous Sassicaia is made. San Guido lies a short distance from Bolgheri, close to the western Italian shore south of Livorno. Only one wine is produced at Tenuta San Guido - Sassicaia. It is a blend of at least 85% Cabernet Sauvignon and up to 15% Cabernet Franc. About 15000 cases of Sassicaia are produced annually from the low-yielding vines. The average yield is about 37 hecto-liter/hectar. 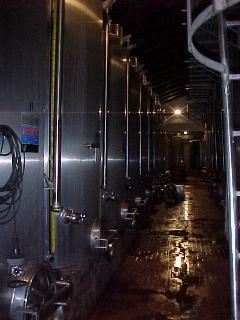 The fermentation takes place in large stainless-steel vats. 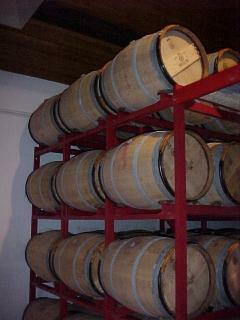 The wine then is aged in French oak barrique, a third of which is new. The wine is made from vines coming from a few separate parcels, all of them in the huge Tenuta San Guido estate. The estate comprises of 2500 hectars, of which only about 60 hectars are devoted to vines (the majority of the estate is woodland while another important part is devoted to horse thoroughbred training center). Stressing his aim at complexity and finesse rather than sheer power, the Marchese showed unveiled contempt for American critics (guess who...) that downgrade his wines whenever they don't turn out to be real blockbusters. After explaining his winemaking philosophy, Niccolo della Rocchetta invited us to taste the three most recent vintages of Sassicaia, followed by the 20 years-old 1980 vintage. 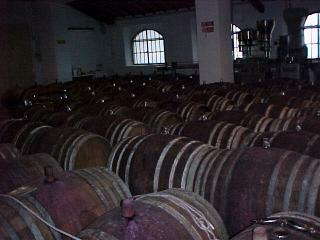 1999 Sassicaia - Still in barrel. Very dark appearance, grapey nose, a bit assertive on the palate. Still so young I really can't make any serious assessment. Fine. 1998 Sassicaia - Not yet released. Dark appearance, grapey nose, deeper and more complex than the 1999. Multi-flavored with excellent grip. Interesting and very fine. 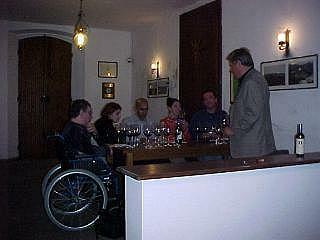 1997 Sassicaia - The currently available vintage. Deep dark color. Really fine nose of black forest fruit with a fine backdrop of wood tones. Multi-dimensional and mouthfilling. Still young and somewhat tannic, but very long and finely balanced. Superb! 1980 Sassicaia - Obviously older than the younger vintages. A bit brownish with noticeable clearing around the rim. Somewhat maderized nose that is still very much alive fruity and complex. Deep, fully matured, flavors that linger. Smooth and soft finish. 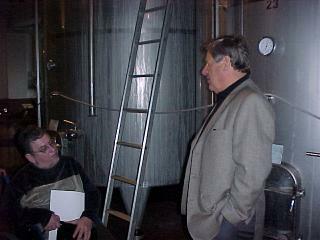 According to della Rocchetta, 1980 was never considered to be a great vintage. Still, a superb wine!